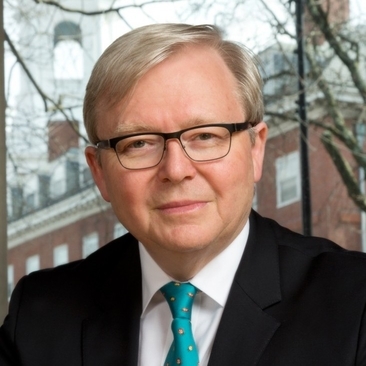 Mr. Rudd served as Australia’s 26th Prime Minister (2007-2010, 2013) and as Foreign Minister (2010-2012). He led Australia’s response during the GlobalFinancial Crisis, reviewed by the IMF as the most effective stimulus strategy of all member states. Australia was the only major developed economy not to go into recession. Mr. Rudd helped found the G20 to drive the global response to the crisis,and which in 2009 helped prevent the crisis from spiraling into depression. The rise of populism throughout the western world has caught many by surprise. Impacts spread far beyond the political realm: trade agreements, international financial mechanisms, multilateral institutions, and even macroeconomic performance will be affected by this shifting backdrop. What is the risk of a new era of trade protectionism? Do concerns over political sovereignty pose a threat to past or future global economic integration? Fundamental challenges to past assumptions on politics and markets pose threats for international businesses. There may also be rewards for those who successfully navigate growing uncertainty. In a changing political landscape, corporations will need leaders who can operate in both the political and business world. Hear from our expert panel as they discuss the strategic considerations savvy global businesses will be taking over the coming years. Speakers from this panel include experts from Albright Stonebridge Group, Control Risks, and Willis Towers Watson. The panel will be moderated by Professor Jonathan Brookfield of The Fletcher School.